Product prices and availability are accurate as of 2019-04-23 14:34:25 UTC and are subject to change. Any price and availability information displayed on http://www.amazon.com/ at the time of purchase will apply to the purchase of this product. 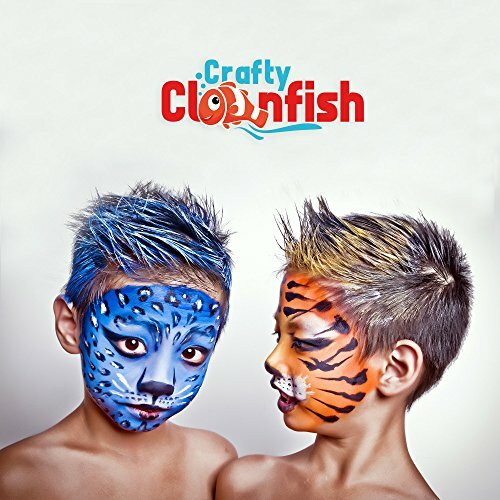 STARTING TODAY: Delight Your Children & Bring Color To Your Parties With The Unique Crafty Clownfish Face Painting Palette! Are you a professional artist who needs painting supplies for your little customers? Are you a caring parent who wants to have fun with your kids, creating the most adorable face designs? In Any Case This 16 Color Face Paint Kit Is Just What You & You Little Ones Need! This adorable face painting kit includes 16 vivid colors that your children will definitely love! Choose among white, black, red, blue, yellow, bright yellow, orange, green, purple, pink, peach, turquoise, lime, chocolate, gold and silver and create amazing face art designs fast and easy! For your convenience these face painting kits for kids and adults includes 3 great sponges while the paints are water activated for easy application and even easier removal. Quality Comes First - Offer Your Children The Care They Deserve! Sprinkle Some Magic At Your Parties - Put A Smile On Children's Face Hassle Free! Your children and their friends would be on cloud nine knowing that they can hold a great birthday- face painting party! And don't worry about not being a professional artist! The paints are super easy to use, and you will receive a FREE BONUS ebook with pro face painting tips and step by step instructions for creating beautiful designs for boys and girls easier than ever.
? 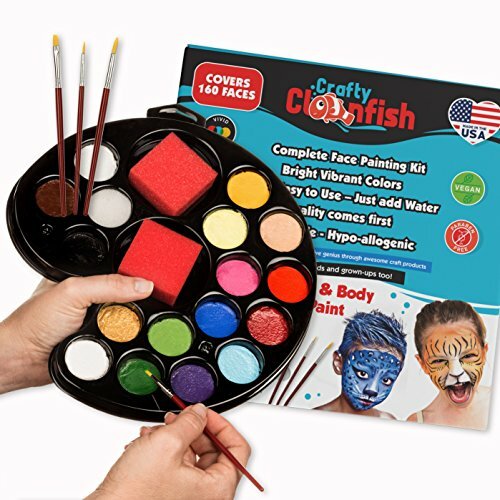 FACE PAINTING KITS with FREE BONUS ebook16 different colors (14oz) size 3 BRUSHES 3 sponges you have all the supplies you need to paint over 160 faces! Perfect for Gift for Kids and Adults ? SUPER EASY TO APPLY & HASSLE FREE REMOVAL: The paints are "Water Activated" and with just some drops of water they work like a charm, while they dry within 1 minute. No more greasy faces! ? 100% SAFE FOR YOU & YOUR KIDS: Made of hypoallergenic, Paraben-Free, non-toxic, oil free and fragrance free ingredients, you can use this palette for your kid's delicate skin with peace of mind! ? CERTIFIED QUALITY- MADE IN USA: Paints are in full compliance with EU, Canadian, Mexican toy & cosmetic regulations. The quality of this strictly vegan, FDA approved kit is unmatched! ? 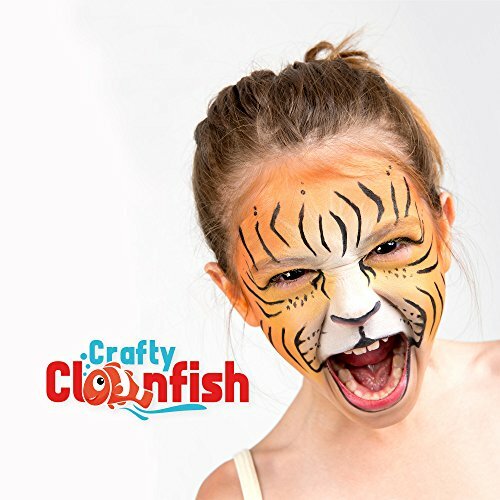 GET IT WITH CONFIDENCE: Being so sure about the great quality and performance of this amazing face paint kit, Crafty Clownfish offers you a LIFETIME -NO QUESTIONS ASKED- SATISFACTION GUARANTEE!